News - TalkClok is totally changing the way you wake up and start your day. Are you a family manager and you want to hear the day’s schedule when you wake up? We created the best talking iPhone Alarm Clock App imaginable. Free Download at the Appstore! Are you a blogger and tweets inspire your awakening? Whoever you are , TalkClok runs up your day. Wake up with your need for information! Download TalkClok now for free & let’s configure it step by step. Read how to do your traffic & routing settings. TalkClok Alarm App. Let’s configure TalkClok step by step. Read how to do your weather settings. Download TalkClok at the App Store for free! TalkClok – a customizable alarm clock app. Read how you set and manage alarms & download TalkClok now for free! 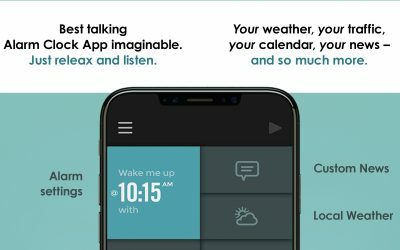 TalkClok – A customizable Alarm Clock App that talks to you: your weather, your traffic, your calendar, your tweets – and so much more. Read how to find the right voice & download now for free .